Since so many of us are already thinking about when we come back in the fall (lol) .... Here is a great idea for helping parents remember to practice spelling and reading word wall words with their kids. I pinned this idea from Tristine Range on Pinterest. Wow! I had these made from Vistaprint this year and I also had business cards made for students to keep in their workboxes. 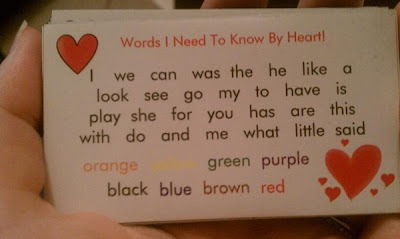 I call our sight words Heart Words too! Did you use a blank template on Vista or a premade template? I LOVE this idea, but am not sure how to go about creating them on Vista. It seems most of their products are geared towards making business cards. I wish I could answer that question, but I just pinned the idea so I am not sure. Try the link for where the pin came from and see if you can ask the question on Pinterest. Hey that's me! I made that! It took a little while to make but was worth it.